Participants join a dual quest in the Attack on Titan storyworld. 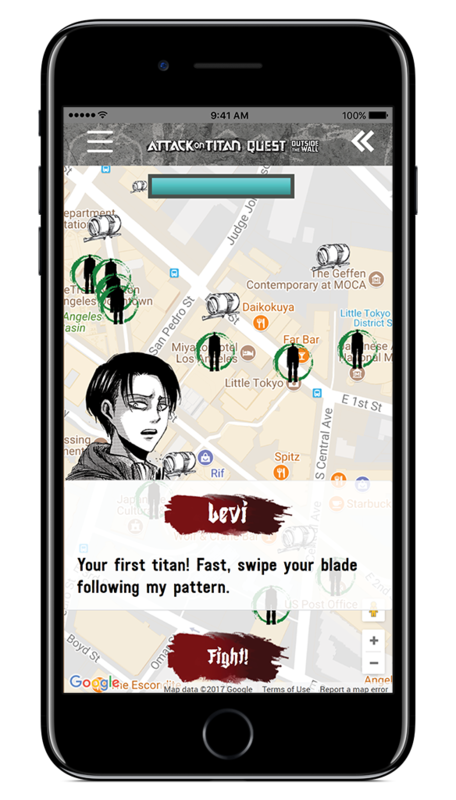 "Outside the walls" is a geolocation game that rewards you for finding and defeating titans in Little Tokio. "Inside the walls" is an SMS cadet training programme that takes you from booth to booth in Anime Expo, searching for the right answers. Designed for Anime Expo 2017 in LA, Attack on Titan Quest is a two-part location-based experience developed by Conducttr for AoT publisher Kodansha. The narrative of the experience is that the convention center for Anime Expo, LA is “inside the wall” and Little Tokyo is “outside the wall”. Consistent with the AoT storyworld, inside the wall is positioned as a training exercise requiring players to find five missing soldiers while outside the wall is a full-on mission to defeat increasingly stronger Titans. Both quests are independent of the other but story is built so it’s more fun to complete both. The outside quest uses a web application built on our Communicator framework (with back-end naturally powered by the Conducttr story-gaming engine) and requires the player to be in LA and to enable location services on their browser. During development and testing we could play online without going to a specific location but licencing restrictions allow us only to offer the location-based LA experience to the public. The inside quest is a more familiar SMS-based scavenger hunt. Part of the reason for the switch of channels is expectations of poor WiFi and internet reception that is typical of most conference venues. While the inside quest requires players to follow a pre-defined path (as discovering each checkpoint reveals a clue to finding the next), the outside quest allows a more free-flowing route with players able to visit Titan hotspots in the order of their choosing. Those familiar with AoT will know that to kill a Titan requires the soldier to slice the back of the neck. In our game we test the player’s sword skills with increasingly complex swipe patterns (see image above) against a vanishing fight period. This simple mechanic combined with the minimally frustrating requirement to maintain a sufficient gas supply (the swords are gas-powered) delivers an extremely fun experience. A highlight of the SMS experience is several phone calls from the popular AoT character, Mikasa. The calls were recorded by the same actress that is the voice-over artist for the anime which screens on Funimation. This means the voice is familiar to the show’s millions of viewers and when heard directly spoken to YOU via your phone creates an incredible intimacy that is actually quite mind-blowing.